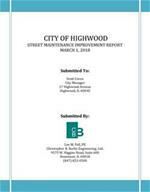 Christopher B. Burke Engineering, Ltd. organized an extensive pavement maintenance program for the City of Highwood and has scheduled a program of various construction maintenance techniques to most efficiently maintain the integrity of the City Streets as described in the Street Maintenance Improvement Report - March 2018. In summary, the City’s current pavement condition index (PCI) value of 6.8 (Good) emphasizes the dedication and attention the City has made to their street network investment to this point. The useful life-span of both concrete and asphalt streets can be extended through a variety of street repair and preventative methods. The city's budget for street renovation is sufficient to pay for ongoing maintenance needs. Although aesthetically unappealing in the eyes of some, preventative crack sealing is a cost-effective way to fill pavement cracks caused by ultra-violet rays and bad weather with a hot, rubberized asphalt so that water does not enter the base and cause extensive damage. This is a method whereby an inch and a half layer of new asphalt is laid over existing pavement and rolled to a smooth finish for a new driving surface that typically lasts 7-12 years, depending on road usage. Eventually streets will fail, requiring reconstruction. Due to the high cost associated with street reconstruction, these are funded by the city issuing debt. Given this limited budget, the city has developed a priority plan to identify a limited number of streets for reconstruction.